At the center of this controversy stood the two most famous men in America: President Franklin D. Roosevelt, who championed the interventionist cause, and aviator Charles Lindbergh, who as unofficial leader and spokesman for America’s isolationists emerged as the president’s most formidable adversary. Their contest of wills personified the divisions within the country at large, and Lynne Olson makes masterly use of their dramatic personal stories to create a poignant and riveting narrative. While FDR, buffeted by political pressures on all sides, struggled to marshal public support for aid to Winston Churchill’s Britain, Lindbergh saw his heroic reputation besmirched—and his marriage thrown into turmoil—by allegations that he was a Nazi sympathizer. Spanning the years 1939 to 1941, Those Angry Days vividly re-creates the rancorous internal squabbles that gripped the United States in the period leading up to Pearl Harbor. After Germany vanquished most of Europe, America found itself torn between its traditional isolationism and the urgent need to come to the aid of Britain, the only country still battling Hitler. The conflict over intervention was, as FDR noted, “a dirty fight,” rife with chicanery and intrigue, and Those Angry Days recounts every bruising detail. In Washington, a group of high-ranking military officers, including the Air Force chief of staff, worked to sabotage FDR’s pro-British policies. Roosevelt, meanwhile, authorized FBI wiretaps of Lindbergh and other opponents of intervention. At the same time, a covert British operation, approved by the president, spied on antiwar groups, dug up dirt on congressional isolationists, and planted propaganda in U.S. newspapers. The stakes could not have been higher. The combatants were larger than life. 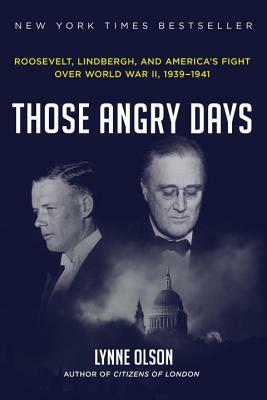 With the immediacy of a great novel, Those Angry Days brilliantly recalls a time fraught with danger when the future of democracy and America’s role in the world hung in the balance. Lynne Olson is the author of Citizens of London: The Americans Who Stood with Britain in its Darkest, Finest Hour; Troublesome Young Men: The Rebels Who Brought Churchill to Power and Helped Save England; and Freedom’s Daughters: The Unsung Heroines of the Civil Rights Movement from 1830 to 1970, and co-author of two other books. She lives with her husband in Washington, D.C.